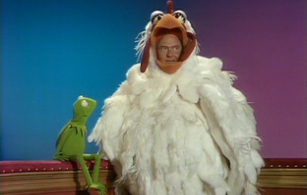 And so we come to the Harvey Korman episode, which finds in Korman an unusual guest with an entirely different energy with the Muppets than any previous human on the show, and which features a number of classic moments–one of which is the sketch where The Muppet Show writers finally “found” Fozzie as a character–but, unfortunately, is the overall weakest installment yet. The whole is much lesser than the sum of its parts, and the main reason is that there is practically no backstage material whatsoever, other than one solitary bit that lasts literally seconds. For the bulk of the show, it’s basically just a regular variety show with puppets, without even much Muppety screw-ups and chaos gumming up the works. I’ve spoken of how the season 1 plots were rudimentary at best, but this one hardly even has a rudimentary one. On the plus side, it is arguably the first “plot” to directly involve the guest. But that “plot” is just a single gag that’s threaded through two short scenes, total, and then the curtain call. That’s it. Now, I just referenced above that Korman was a different sort of guest compared to the others up to this point. On paper, that might not seem to be the case. After all, he was a variety show comedian, just like Ruth Buzzi the week before, but what made him stand out was that he brought an acerbic sort of grumpiness to his performance. In the last post, I spoke about how some of the best human guests on The Muppet Show were ones who emobodied a bouncy, Muppety energy themselves, and in some ways, Korman would seem to be the polar opposite. Rather than reveling in joy at being with the Muppets, he actually plays up his discomfort at being there, but rather than this being unintentional discomfort such as with someone like Juliet Prowse, who just came across as a little awkward in interacting with them, this is purposeful. As much fun as it can be to watch a guest star fawn over the Muppets, in this episode, the show discovered that there’s also a lot of potential in someone who almost flat-out rebels against the Muppet spirit, which creates a sort of dissonant energy that can yield even more anarchic comedic fodder. The panel debates the meaning of life. Unlike all of the other previous guests, Korman doesn’t take part in a single musical number, and most of his sketches find him at odds with the Muppets. 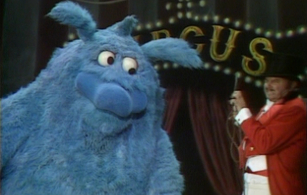 In his first, he’s an angry circus ringmaster called Maurice, trying to show off his skills taming a “mighty beast,” who turns out to be…Thog! Throughout the scene, Maurice fiercely cracks his whip, attempting to demonstrate how fearsome he himself is, while the huge, cuddly Thog sweetly undercuts him at every turn. When Maurice commands that he speak, Thog not only does so but says, “I was reading Balzac the other day…” giving lie to the claim that he’s a wild animal, then paying Maurice the compliment of “You’re very good at cracking that whip!” When Maurice commands he dance, Thog does a delicate little softshoe and tells us that “I wanted to ride my pony around the stage but Maurice is afraid of ponies.” Finally, Thog grabs Maurice–who is getting more and more enraged by this point–and forces him into a lovely waltz, eventually waltzing him right into his (Thog’s) cage and locking him inside! 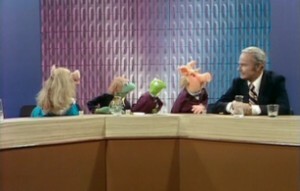 Next up, in the panel discussion sketch, Harvey gets in a fight with Miss Piggy (again played by Richard Hunt). The subject up for debate is the (according to Kermit) “simple subject” of the meaning of life, and when Harvey compares life to a tennis game, Piggy insists that, “No, it isn’t!” He childishly replies, “Yes, it is!” starting off a back and forth between them, until it starts getting vicious. “In a pig’s eye, it isn’t!” he says at one point and when one of the others awards Piggy a point, Harvey replies, “First time that pig scored in her life!” And in his next minor bit (the only backstage scene in the entire episode), Rowlf tries to tell Harvey that he’s worried about ecology, and Harvey snaps at him that he doesn’t have time to worry about that because he has to be on stage. Kermit: Aren’t you having a great time? Harvey: Kermit, we’re friends. Don’t you want me to tell you the truth? Kermit: Only if you’re having a great time. Otherwise, you have my permission to lie like crazy. I love this bit, because it’s a great example not only of Kermit’s undying optimism but also his ability to sneak in a little snark himself underneath his amiable surface. But anyway, Harvey goes on to complain that his problem is that he’s the only person in the theatre. “How’d you like to sit in your dressing room surrounded by dogs and frogs and pigs and chickens?” Harvey asks, which is a bit of a rude/bigoted question, given (a) Kermit is a frog, and (b) of course, Kermit knows what it’s like to be surrounded by a crazy assortment of animals all the time…it’s his life! But Harvey clarifies that it isn’t that he doesn’t like them, it’s just that he feels funny being the only person there. The ever-resourceful Kermit has the perfect solution, however! He calls in a team of Muppets who all surround and descend upon Harvey, and a moment later, when they clear off, we discover that they have shoved him inside a giant chicken costume, essentially turning him into a huge Muppet! Kermit talks to Chicken Little. And so, instead of trying to force Harvey Korman into a sweet, bubbly persona in order to match the Muppets, the writers wisely used his more prickly persona to their advantage, allowing the Muppets to discover humor in having conflicts with him, and my personal theory is that this is where the concept behind all the great human villains in the Muppet films first took root. In the previous entry, I spoke about how what was great about Ruth Buzzi is that not only did she treat the Muppets like real creatures in her episode but she had no problem getting very physical with them–roughing them up, tickling them–and a similar sort of thing happens with their best human baddies, who get in the Muppets’ faces, showing them no respect, sometimes physically assaulting them, but in the process also fully selling that they consider them real. Sometimes, humans being jerks to these sweet, lovable weirdoes can create the funniest Muppet interactions.